Jacqueline Crump, a Florida native, born and bred, and Gainesville resident since 1998, is now a member of “The Orange Team” with Doctor B. Hoh. She describes her area of focus as being on the “inpatient side of things”. That said, her experience is long and varied. She earned her Bachelor’s degree and followed that up with a Master’s degree in nursing at the University of Florida. Between degrees she worked for about two years in the Surgical Intensive Care Unit at Shands Hospital in Gainesville. After Graduate school she returned to Shands to work at the Comprehensive Care Management unit which came to include neurological surgery patients while she was there. 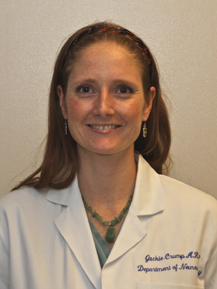 A developing interest in neurological surgery lead her ultimately to join the Department of Neurosurgery. She likes to spend her free time with “a wonderful husband and two handsome boys”.